Note: These settings are for importing Models and animation created in most 3D modeling applications. However, Models created in SpeedTree have special settings. 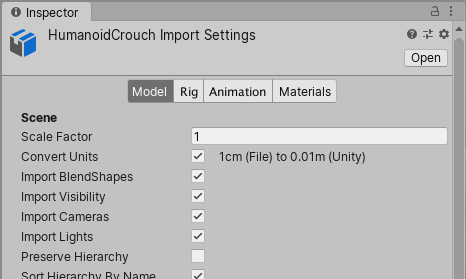 For more information, see the SpeedTree Import Settings window. See in Glossary objects that the model Prefab references. You can extract Materials and Textures or leave them embedded within the model. You can also adjust how Material is mapped in the Model.